Since the Protestant Reformation, the many small villages around the Hunsrück town of Kleinich make up a parish, the Lutheran “Kirchspiel” of Kleinich. This name has remained until today, even when, after the French Revolution, the civil regional authority was created and the “Kirchspiel” (parish) was turned into the municipality of Kleinich. Pretty, slate-clad farms and houses characterise these villages. 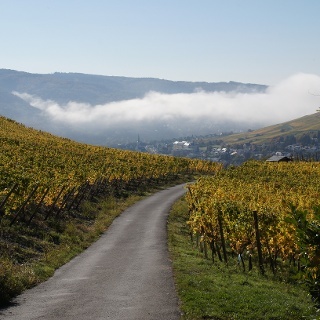 They are spread four to five hundred meters across the Moselle in a hilly, open landscape, occasionally interrupted by densely forested creek valleys. The up and down of mountain and valley with fantastic views characterise a hike on the Side Trail “Kirchspiel’s Valley Tour”. Take a picknick lunch with you! There is no possibility to buy refreshments or supplies on the way. An ideal path for lovers of peace and seclusion! Please be very careful when hiking on wet rocky sections. It might be impossible to cross the river on the stepping stones at high water. One of the starting points of the about 13 km long hike through the Kirchspiel Kleinich is at the Protestant church Kleinich. Thanks to the special location of the church, you will see the church tower from many points of the round trip. As with many churches in the Hunsrück, this church also has a silent organ. 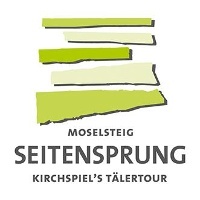 The Moselsteig Side Trail "Kirchspiel's Tälertour" first leads through the village. The former farmhouses are partly beautifully renovated. From the outskirts of the village the dirt road slowly ascends through the open corridor. 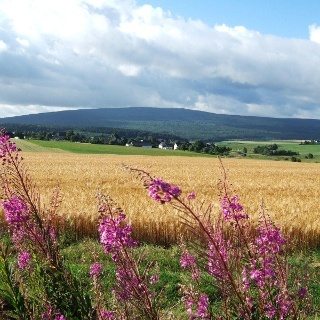 The view opens up far beyond the heights, and especially to the west, you can see meadows and fields right up to the hilltops of the Vulkaneifel on the horizon. At the edge of the forest you have reached the highest point of the entire round tour. The bench is perfect for a short rest and enjoying the view back to Kleinach. Now the Side Trail leads into the valley. First, still along the edge of the forest, then over a path through the spruce forest directly to the stream. This is a shady and cool place on a hot summer's day. The tour crosses the rippling stream and continues further downhill on the other side over a forest path. After a side valley, the path ascends again and you reach a terrain edge which is bounded by interestingly grown oak trees. The path now takes you out of the valley. When you look over the hilltops once you have arrived at the meadow section, you can recognise Emmeroth, with its houses in a dip. The path takes you straight into the village. At the outskirts of the village there are some new houses, but in the centre, the old half-timbered houses have remained, some even with cobbled courtyards. On a meadow path at the same height you leave the village again. From this path you have a view of the church tower of the Kleinich church and across the valley to Fronhofen, which the Side Trail will reach a little later. From the road, a path turns off which takes you steeply up the ridge. Through the birch forest you reach the summit of the Kordelberg, where you will also find a barbecue hut and rest places. The path now continues steeply downhill to Pilmeroth, with an imposing old oak tree at the outskirts of the town. Past the cattle scale and the fountain, the trail quickly returns to the surrounding meadows and fields. From here you have an expansive view towards the Moselle and the deeply cut valleys of Kautenbach, Trabener Bach and Ilsbach. Over a forest path, the Side Trail now leads to the Ilsbachtal. The last section to the stream is very steep. Here the path is lined over and again by large quartzite blocks. The path follows the stream, which flows here over small rocky steps towards the Moselle. 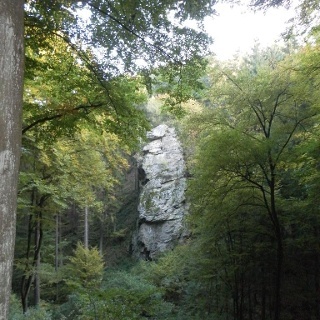 On the other side of the path the Bildstein rock builds up. A wild and romantic place. The path changes the side of the stream and the subsequent section takes you further down the valley with beautiful views of the water. Entrances of slate caves and remnants of a mill remind of the fact that the valley was not always used for recreational purposes only. The Side Trail changes from the Trabener Bachtal to the valley of the Kautenbach. The road now ascends slightly. After you have changed the valley side, the path winds through the forest with views of the stream. 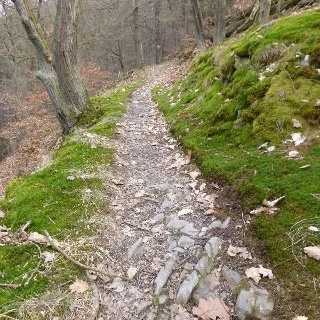 The Side Trail also touches the route of an old road connection, which used to run from the Moselle Valley to Hunsrück. The rock was broken through for this path.A very impressive geological insight. The path continues at a pleasant incline further through the forest up the slope. The view of Fronhofen which is located almost at the very top of the ridge opens up. Continuing uphill, you finally reach the village, which the path just brushes. At the outskirts of the village you have finally arrived back on the height and can admire large parts of the section you have covered. 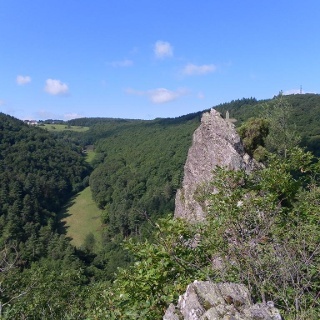 But also beyond here, views far into the Eifel are possible. Following a meadow path, at the same height, you reach the road between Fronhofen and Kleinich. Along the road, the path comfortably leads back to the starting point, not without a great view of the church tower of Kleinich where the Side Trail "Kirchspiel's Tälertour" started. The villages of the Kirchspiel Kleinich are only partially serviced by bus. We recommend travelling by car. sehr schöne Streckenführung entlang von Bachtälern. Wir haben den Einstieg in Pilmeroth gemacht und sind dann in Frohnhofen abgebogen. Die verkürzte Tour war so nur noch knapp 7km lang und in 2 Stunden bewältigt. Sehr zu empfehlen ist eine Erfrischung unter schattigen Bäumen im Wildkräutergarten Cafe in Frohnhofen - nur wenige Meter abseits der Strecke! Der Weg ist vorbildlich ausgeschildert undgut zu gehen. Die Furth ist jetzt durch eine Brücke ersetzt.